Director: Josie Hughes. Cast: Saoirse Ronan, Margot Robbie, James McArdle, Jack Lowden, Guy Pearce, Adrian Lester, Joe Alwyn, David Tennant, Izuka Hoyle, Gemma Chan, Martin Compston, Maria Dragus, Eileen O'Higgins, Liah O'Prey, Ian Hart, Ismael Cruz Cordova, Adam Bond, Simon Russell Beale, Aneurin Pascoe, Greg Miller Burns, Adrian Derrick-Palmer, Luke Hobson, Ben Wiggins, Eldredd Wolf. 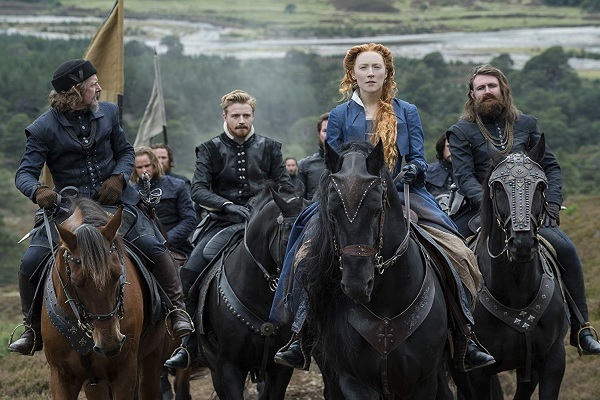 Screenplay: Beau Willimon (based on the book Queen of Scots: The True Life of Mary Stuart by John Guy). Twitter Capsule: Clumsily modern. Endless cuts to Meaningful Looks. Wan buildup badly blunts climactic Queen vs Queen faceoff. Second Capsule: Ronan gambled on big theater directors in all her 2018 releases: Seagull, Chesil, Mary. Each film and performance paid largely grim rewards. Third Capsule: I guess I appreciate the makers' efforts to show they're Good with the Gays but boy do they lingertwiceon the violent deaths of queer men. VOR: ② Makes little case for itself, beyond showcasing two rather ill-served actresses, a thin hurrah for female leaders, and lame lunges at being "modern."